We've all been there. What could you possibly do with a rack full of vowels? The obvious answer? Exchange letters. Passing your turn and swapping the majority of your tiles seems like a no-brainer. The moment you see them, that's what you're thinking. Why even waste mental energy on a rack full of vowels? But you shouldn't be so hasty. Exchanging letters means you skip a turn, which means no points for that turn, giving your opponent a chance to take the lead. I'm completely against exchanging letters, not that I haven't done it. There are plenty of cases when you just have to, but most of the time you could place those letters you're exchanging on the board, effectively "exchanging" your letters and scoring some points at that. Exchanging letters seems like the best move, and it just might be, but how many letters were you planning on exchanging? Seven? Six? Four? No matter what, you're definitely tanking the U tile. But in my opinion, exchanging only hurts you in this case, because you never know what you're going to get back. It could be the exact same letters. Then what are you going to do? See? It's effectively the same thing as exchanging those four letters, but you got to score some points in the process. It was only 9 points, but it's better than 0, right? If you plan on spelling a word using only vowels, then you don't have many choices. If you're playing in North America, the only words you can spell without consonants are AA, AE, AI, OE, OI and EAU. 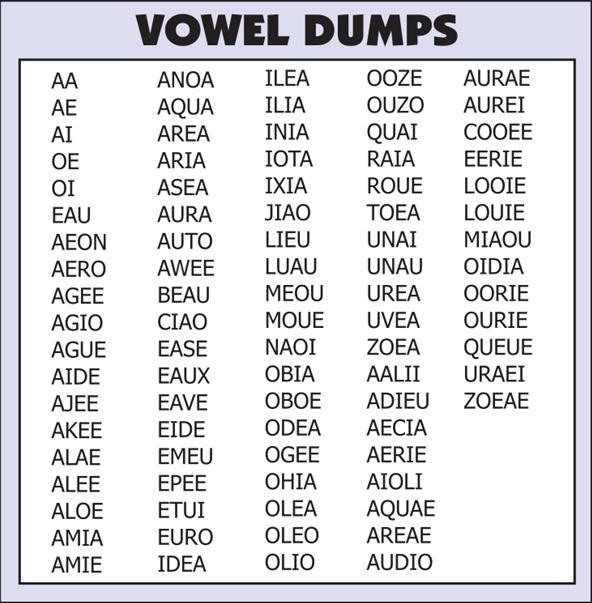 Outside of North American, there's way more: AA, AE, AI, EA, EE, IO, OE, OI, OO, OU, AIA, AUA, AUE, EAU, EUOI and EUOUAE. Okay, now that you've studied up on the vowel-heavy words, it's time to test your skills. You're stuck with the following rack full of vowels. What do you do? Admit it—the first thing you thought about doing was exchanging letters. But should you? Using the game board below and your rack of A, U, E, E, O, I, I, find out the best play. Would it be exchanging letters and passing your turn, or is there a vowel-heavy word that you can place on the board? Post your answers/thoughts in the comments below. ** Click here for the answer. 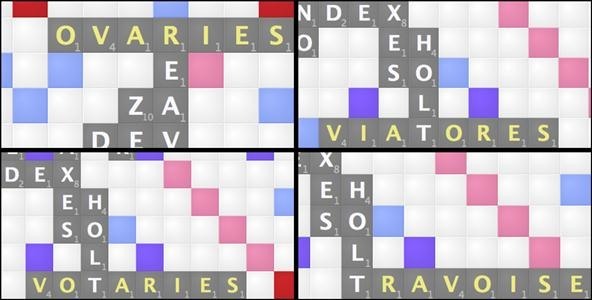 Q: Using the letters provided, find a bingo play (use all seven of the letters) on the board that either spells a phoney-looking word, or spells a separate phoney-looking word by connection. 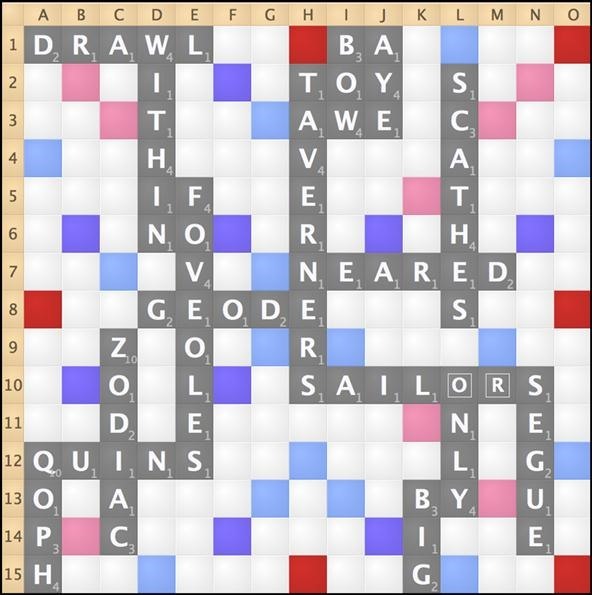 A: Though there could be multiple answers for creating an actual phoney word out of all seven letters, or creating one by connection, the most obvious answer is found within the five legitimate bingo plays possible. You can spell either OVARIES, (T)RAVOISE, VO(T)ARIES, or VIA(T)ORES. 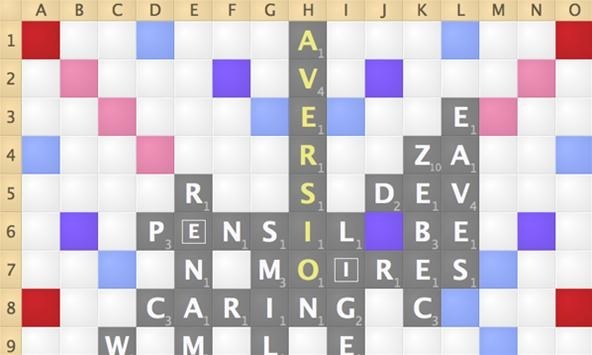 But the answer is the fifth bingo play AVERSIO(N), which also spells PENSIL on the game board, a word that could easily trick someone into challenging, mistaken for PENCIL. Possibly even PENCEL, since it's the more common spelling of PENSIL. This move is also the highest scoring (100 points). P.S. 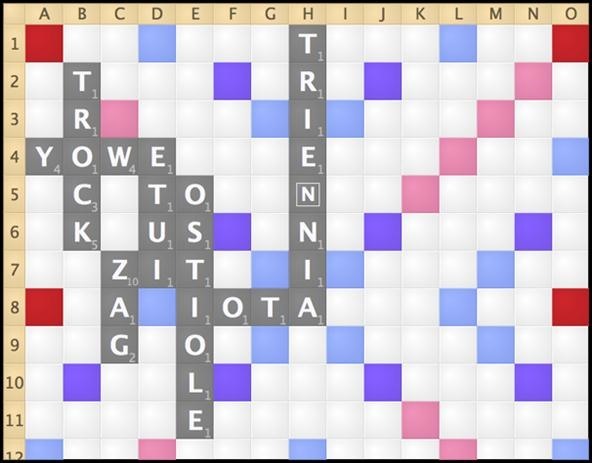 It was a total coincidence that one of the odd, legitimate bingo words acceptable (TRAVOISE) in this puzzle was the same that Joel Sherman played in his record-breaking game last weekend. This puzzle was actually made before that game.